Potassium is a major constituent within all living cells. It is an essential nutrient and is required in large amounts by plants. Potassium acts to regulate water balance, nutrient and sugar movement in plant tissue, drives starch and protein synthesis, disease resistance and nitrogen fixation. Potassium aids the plant by preventing many diseases and heat damage. Potassium helps in cycling of nutrients through leaves, roots, and stems. 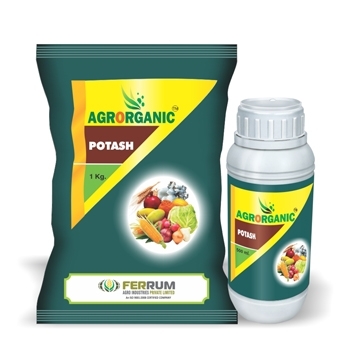 To overcome all the major problems faced by using inorganic Potash , Ferrum Agro Industries Private Limited have manufactured AGRORGANIC® Potash by Complexing Potassium with Gluconate and Amino acids. - Helps in photosynthesis and formation of energy-high compounds (EHC), boosts vegetative growth. - Application of AGRORGANIC® Potash makes cell walls harder which serve to increase resistance to agricultural pests and diseases. - Improves the colour of the fruits, thus increasing their market value and consumer acceptance. - Maintains turgor, reduces water loss and wilting and also increase plant resistance to drought. Granular formulation is available in 10 kg and 25 kg bags.